Scarborough is one of the most vibrant districts in the Greater Toronto Area, and its local businesses contribute to the diverse and bustling community. It’s a great place to set up a company – as long as you have what it takes to stand out from the competition. If you’re wondering how you can get that edge, it may be time to call Alliance Interiors and update your office interior design. Your work environment has a much bigger influence on your bottom line than you might think. When you work with Alliance Interiors to remodel your office, improve your layout, add new furniture, or even move to a new location, you’ll discover just how big a difference an optimal workspace can make. At Alliance Interiors, we understand that you have to keep your business overhead under control, and remodeling your office might not seem like the biggest priority. However, even if you think your current workspace is “good enough,” there are many ways that a strategic remodel can help streamline your daily operations and improve your bottom line. An optimized office layout can improve employee communication. Team members shouldn’t have to shout across the office or traipse to the opposite side of the room – distracting other co-workers in the process – in order to communicate. Alliance Interiors can help you plan and implement a new office layout to encourage collaboration while also minimizing excess noise. A better work environment = increased productivity. It’s no surprise that people get more work done when they are in a stimulating environment than when they’re in a bare, windowless bullpen. Maybe your own office isn’t quite that grim, but there are probably still changes you could make that would help employees focus better, stay energized, and do their best work. 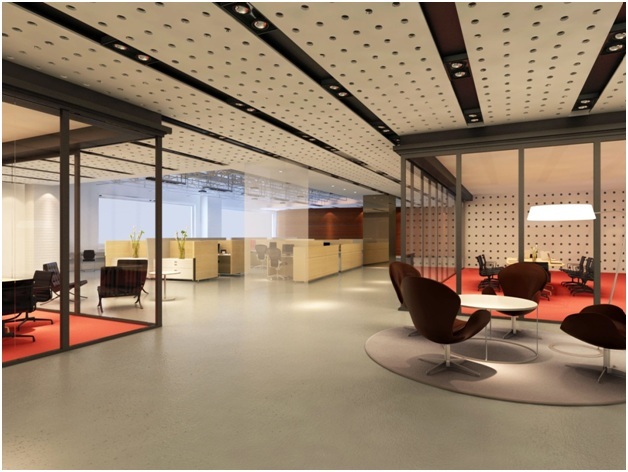 A well-designed office gives clients and job candidates a good impression. If you’re inviting clients, customers, or potential job candidates into your office, you need to make sure your workspace gives them the right idea about your business. If you want your business to seem modern, for example, but all your furniture is at least a decade old, you’re sending the wrong message. Let Alliance Interiors help you update your office to better represent your brand and attract top clients and job candidates. A good work environment improves morale. Remember how we said that a stimulating work environment promotes productivity? It also improves morale by making employees feel good about the place they work. This will be reflected in their attitude and the jobs that they undertake. A few smart changes can even improve employee wellness. That’s right—good interior design can even help prevent injuries and minimize employee absenteeism. How? More comfortable furniture, such as ergonomic chairs and adjustable desks, can help employees avoid repetition-based injuries, and a better layout can help you minimize the spread of germs, leading to fewer sick days throughout the year. Office Interior Design. We take on projects of all sizes, whether you just want to add a few design elements to stimulate your employees’ creativity or you want to do a complete overhaul. Home Office Design. You don’t need to have a huge space to work with Alliance Interiors. We’re experienced working with solo entrepreneurs, freelancers, and business owners who just want to have a space available when they take work home with them. We’ll work with you to set up a space that minimizes distractions and allows you to stay motivated while working from home. Office Space Planning. Having the right office layout is the key to making sure your business runs efficiently. Let Alliance Interiors help you turn your office into a well-oiled machine by rethinking workstations, collaborative areas, and furniture placement to make the most of the space available. Office Relocation. Moving your business to a new location in the Greater Toronto area? Alliance Interiors can help with that, too. We’ll coordinate your move to ensure that it goes smoothly and you lose as little valuable work time as possible. Project Management. It can be difficult to figure out where to start a design project if you don’t have experience working in the office interior design business. That’s why it’s good to have Alliance Interiors on your side. Before you even start a project, we’ll help you come up with a budget, timeline, and goals to improve your business through strategic design changes. We’ll even procure construction drawings if you need them. Office Furniture Procurement. Your Scarborough office needs furniture that not only looks great but is long-lasting, improves efficiency, and keeps you and your employees comfortable. Alliance Interiors can help you find all that with our furniture procurement services. We’d be happy to talk to you about how we choose our furniture providers and what kind of products you can expect from each vendor; just contact us to learn more. We look forward to hearing from you and meeting your office design needs!